In the annals of fandom, there are Star Wars nerds and there is everyone else, in diminishing scope of impact and importance. The object of their impassioned mixed affection and frustration is more commercially successful and culturally penetrating than Star Trek, The Lord of the Rings, Doctor Who, Alien, James Bond, or any other major film-based subculture. Even the deeply-rooted superhero comics milieu that pre-dates all geek film properties doesn’t quite measure up to Star Wars geek culture. Since it inspires such focused devotion from its acolytes, the creative influence of George Lucas’s original space-fantasy trilogy is also unparalleled in contemporary American culture, sparking not only homemade internet creations like Troops or Star Wars Gangsta Rap or the brilliant Star Wars Uncut project (about which more in a moment) but also corporate-funded products from the likes of artists as diverse as Kevin Smith, Seth McFarlane, Simon Pegg and Nick Frost, and J.J. Abrams (whose longtime open fandom finally got him the dream gig of directing the new Star Wars sequel trilogy for Disney beginning in 2015). But the fandom is not uniformly of the positive variety. Indeed, as is pointed out in an insightful soundbite in the course of Alexandre O. Philippe’s comprehensive documentary examination of the Star Wars fanbase’s alternately worshipful and spiteful relationship to the universe’s steward Lucas, it is often a badge of honour for fans of a certain product to be able to prove the intensity of their devotion to that product by openly hating it. Star Wars fandom is nothing if not consensus-based; once an opinion gains intertia among the base, it’s nigh-on impossible to keep it from becoming almost universally accepted. This would seem to be an appropriate tendency considering the nature of the core formative experience of Star Wars fans. As profound as the shared experience of the original trilogy is for fans who first saw it as children, they all basically experienced it in the same way. Every film is ideally open to audience interpretation, but the notable thing about Star Wars as a cultural phenomenon is the lack of variance of interpretation among its legion of fans. They tend to love the same things about Lucas’ creation, and so they mostly hate the same things about it as well. The consensus opinion can be summed up thusly: the first Star Wars film in 1977 (now referred to as Episode IV: A New Hope) was a revelatory experience to those who saw it in theatres (especially if they were young boys), the rest of the so-called “original trilogy” (comprising Episode V: The Empire Strikes Back and Episode VI: Return of the Jedi) satisfactorily completed the saga (to some extent), and fans filled the void left by the absence of further sequels by purchasing mountains of official merchandise. 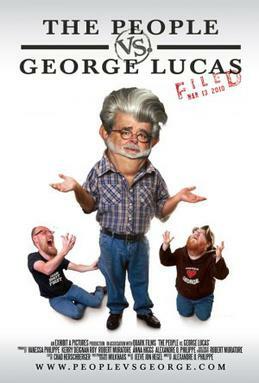 With accelerating advances in computer-generated imagery, Lucas elected to first re-release “special editions” of the existing films with re-mastered sound and image and a series of CG additions (which did not always go over well) and then to return to the Star Wars universe he created and profited from with a prequel trilogy, beginning with Episode I: The Phantom Menace in 1999. Greatly anticipated by longtime Star Wars fans, the prequels were critically panned and savaged by the Original Trilogy generation for dozens of egregious missteps at the least and for violating their childhood dreams at worst. Though they did get better and it’s possible that children might have enjoyed them, the prequels were a forceful end of innocence for older Star Wars fans, a rupture of the charmed relationship between the universe’s creator and his cohort of lifelong devotees. The People vs. George Lucas, despite fandom’s will to consensus and the film’s courtroom-ish title, does not cling to a single perspective or argument concerning the sometimes antagonistic trajectories that fans and creator take to Star Wars. Just because most fans of Star Wars have the same basic experience with the films (the ones they liked and the ones they didn’t), that doesn’t mean that they cope with that experience similarly. Not every fan goes the “George Lucas raped my childhood” route, although that deplorable catchphrase is mentioned, along with other similarly-pitched analogies to child and domestic abuse that betray the callous insensitivity of a largely homosocial fanbase. Just as much blame is apportioned to fan expectations and to the passage of time, and there are appearances by relative apologists for Lucas’s errors, or at least by devil’s advocates who agree that he blew it but don’t agree that he owes the fans a pound of flesh for doing so. But George Lucas does absorb some shots. It wouldn’t be an accurate portrait of this ongoing relationship if he didn’t. The usual complaints are dutifully dragged out and discussed, scanning like an accounting of artistic atrocities for Star Wars geeks and like an indecipherable code to the uninitiated: Greedo Shoots First, the Star Wars Christmas special, midichlorians, Vader’s “Nooooo!” at the end of Revenge of the Sith, and, of course, Jar Jar Binks. Theories are offered for the turning of the space worm, most convincingly Lucas’s insistence on total creative control over his work after his pre-Star Wars run-ins with interfering Hollywood studios, which has led to a creative isolation that has left him out of touch with not only the expectations and tastes of his fans but of the larger culture as well. The most interesting aspect of the love-hate conflict, as I have examined in the past, is the question of ownership of Star Wars as a cultural object, as a cinematic mythos, and what Lucas’s additions and alterations to the popular text jive with fandom’s engagement with and understanding of it. Legal copyright dictates that Star Wars belongs to Lucas (or, now, to Disney; the documentary feels incomplete with the subsequent sale of rights and the promise of new Star Wars films constantly in one’s head). He may do with it as he pleases, even if what he does changes the terms of his fans’ emotional investment in the product, not to mention its constructed meanings. The fans do have a voice, though, a role in the continued construction of the Star Wars myth. The documentary is quite enjoyable as a flood of (sometimes witty, sometimes just petulant) opinions on the ins and outs of that myth; the section detailing the elation and then deflation that characterized the fan reception of The Phantom Menace says nearly all that needs be said about that painful turning point in the fandom’s history (it doesn’t say nearly enough about the film’s old-fashioned and offensive racial stereotyping, I think, but judge for yourself; video is below). But The People vs. George Lucas is at its best when it shines its spotlight on the participatory culture of Star Wars fandom, typified most clearly by the deluge of internet videos expanding, critiquing, and parodying the canonical material. The aforementioned Star Wars Uncut is the most consistently employed example, particularly being utilized by Philippe to fill visual gaps left by the expensive-to-license clips from the Star Wars films. The Uncut project, if you’re unfamiliar, is the brainchild of Casey Pugh, who split A New Hope into 473 15-second segments and put out a call for fans from around the world to craft and submit the scenes to be cut into a fan-made version of the film. It’s remix culture at its simplest, its most surprising, and its most epic. Uncut has everything from amateur camcorder video shot in garages and backyards to sophisticated animation sequences to scenes recreated using cats, alcohol bottles, paper bags, and ferrets as “actors”. It’s a supreme collaborative act of defamiliarization, alternately endearing, impressive, hilarious, and surreal. Nearly everyone with even one eye on pop culture knows A New Hope quite well, yet in this version you never know precisely what’s coming next. And if a certain segment doesn’t work for you, you’re mere seconds from the start (and the end) of the next. It shares A New Hope‘s expert construction and approximates its fresh-eyed creativity as well as anything under the title of Star Wars can, at this juncture, be expected to. Now, of course, we can expect to come at Star Wars with something resembling fresh eyes again, thanks to J.J. Abrams, Disney, and George Lucas’s not inconsiderable greed. As was tangentially mentioned, The People vs. George Lucas might be comprehensive in its examination of three decades of fraught fandom and shifting cultural profiles, but it was completed before the most recent twist in the tale, which casts many of the theories presented about Lucas’s perspective and his relationship to his intergalactic creation in a very different light, if it doesn’t contradict them entirely. Involved in the new films as a creative consultant only, Lucas has nonetheless claimed to exercise guru-like control over the boundaries of his universe, telling the filmmakers that his creation spawned what they can and can’t do and still hold a claim to Star Wars. Even as his world-famous cinematic invention passes largely out of his hands, Lucas won’t entirely relinquish his grip on it. It’s obvious that the opinionated Star Wars geeks of The People vs. George Lucas would nod knowingly at this latest development. Just George being George, after all.